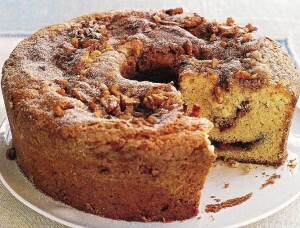 An elegant coffeecake, worth baking for the aroma alone. 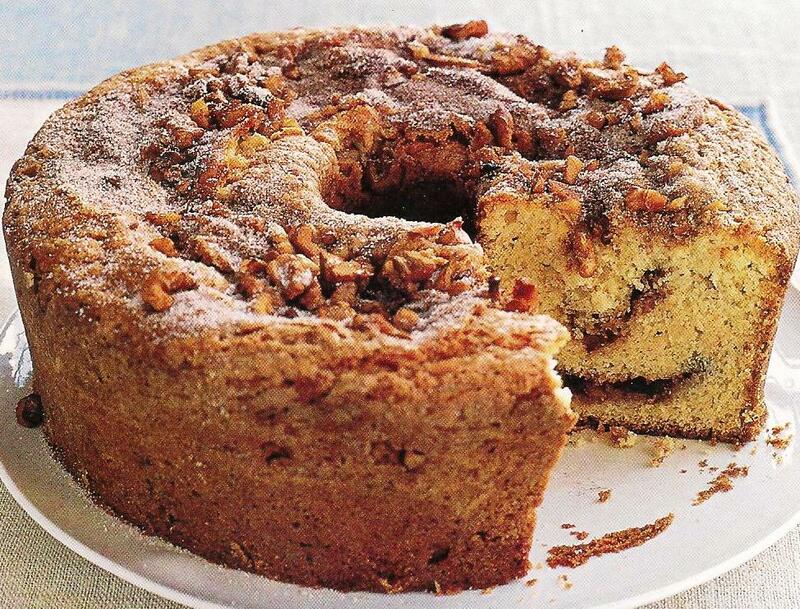 This tender cake is both filled and topped with a cinnamon-y nut topping. I have made this in a tube pan and a 13×9 cake pan, works great in both. Sift and measure flour; sift again with baking powder, soda, and salt. Add eggs and vanilla, beating until light and fluffy. Add flour mixture in three portions alternating with sour cream, beating well after each addition. Spread half of batter in pan. Sprinkle with half of Cinnamon-Nut Topping. Spoon on remaining batter and sprinkle with remaining topping. Bake cake in tube pan 45 to 50 minutes. Bake oblong cake 40 minutes. Cake begins to pull away form side of pan when done. Cool 20 minutes before removing from pan.